All the online casinos offer exciting welcome bonuses to new and regular customers, including Sky Casino. The amounts indicated by most of the online casinos are usually too good to be true, but they do offer the various bonuses. However, different online casinos will have different terms and conditions regarding how the bonus shall be redeemed and how it shall be used. Just like the “other” online casino websites, Sky Casino has a few terms and conditions attached to the bonuses and prizes that they offer. We take a close look at some of these terms and conditions including the Sky Casino Bonus Codes and how you can use them. The welcome offer offered at Sky Casino entails receiving £20 free once you have placed a £5 bet. It required you to place a £5 each way or single bet on any of the sports market at even odds or above and they automatically credit your account with a £20 free bet. Notable, this bonus has a few terms and conditions attached to it, and it's important that we go through the most important ones. The ones that may limit you from getting the bonus itself. To receive the bonus, ensure that you avoid making deposits through Neteller or Skrill. Use other alternatives such as PayPal, and the various cards accepted at the site. This free bet offered is non-withdrawable, and they will usually not be included in your returns. They are simply meant to enable you to win more money. Like stated earlier on, Sky Casino has different bonuses for different areas. In this area, you will be required to make a deposit of £10, play with a total of £70 and you will receive a 100% matched bonus up to a total of £250. Just like the outgoing promotion, this bonus has terms and conditions which you must meet before you can withdraw your bonuses. They are mostly based on wagering requirements, and they are as follows. First, you must make a deposit of £10 or more to receive this bonus. The maximum amount of bonus that you shall be awarded will be £60 or currency equivalent, and it shall be automatically credited to you Sky Casino account once you have accepted it. Once you receive the bonus, you must ensure that you’ve met the wagering requirement of 50× before you can withdraw the winnings, i.e., if you are awarded the maximum bonus of £60, you shall be required to spend up to £3000 before you can withdraw your winnings. In my opinion, this is a bad deal as compared to other online bookmakers such as William Hill and Bet 365. If you fail to meet the wagering requirements before 30 days expire, the funds resulting from the bonus shall be forfeited. Various casino games contribute as follows towards the rollover requirements: All card and table games contribute 20% while the slots games contribute 100%. In this, you receive a welcome bonus of £10 up to a maximum of £500 on your first deposit. To receive this bonus, you have to open an account with Sky Poker and the £10 bonus shall be credited to your account absolutely free. 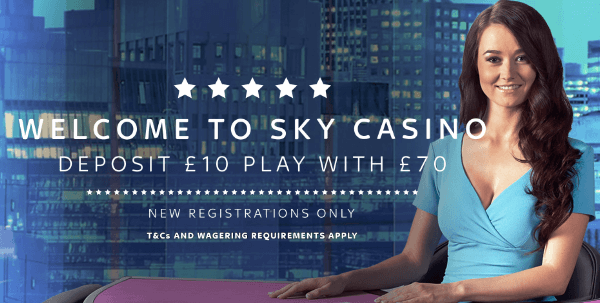 When signing up with Sky Poker, you shall be prompted to enter any promotional codes at your disposal and entering the Sky casino promotional code POKER shall ensure that you receive the £10 token. The bonus is usually credited in four small tokens, i.e., 2 × £3.30 and 2 × £2.20 which you can start using immediately. This bonus cannot be used to play the cash poker games with, but you can spend the bonus on several fantastic Sit & Go’s as well as other tournaments. To receive the £200 bonus, you should make a deposit of £10 or more. Once you earn the bonus, it shall be released in increments of £10, i.e., £10 shall be released into your account for every 250-poker points that you shall earn. You have to ensure that you have released your bonus within the first 30 days after you sign up. In case you are having a little trouble following this, look at the example below. If you make your initial deposit of £50, then you are entitled to receive a £100 bonus once you earn 2,500 poker points in the first 30 days after you sign up for the site. Sky Bingo are feeling very generous, and that is why they are offering the Sky Bingo welcome bonus. To receive the bonus, you should make a deposit and spend £5 on the Bingo tickets and your account shall be automatically credited with a £25 non-withdrawable bonus in addition to the £10 free Rainbow Riches casino game bonus. This bonus is only available to new customers who have attained the age of 18 years and above. Generally, you shall come across at Sky Casino group the sky casino bonus codes. The bonuses may have various Sky Casino Bonus Codes, which are available through the internet, but the ones used here are straight from the Sky Casino website. Have a great time using the Sky Casino Bonus Codes and all the best.